Thursday, October 20, 5:30pm - 7:00pm. We will look at the Leaven site and then walk to NE 19th and Going Street. Notes: Meet in garden at 20th and NE Killingsworth. Do you see the street intersection paintings around town, benches made of earth, or food forests? This event will explore such sights in North Portland and discuss how communities design and install the projects through the City Repair Project. This is a great event if you want to do such a project in your community! 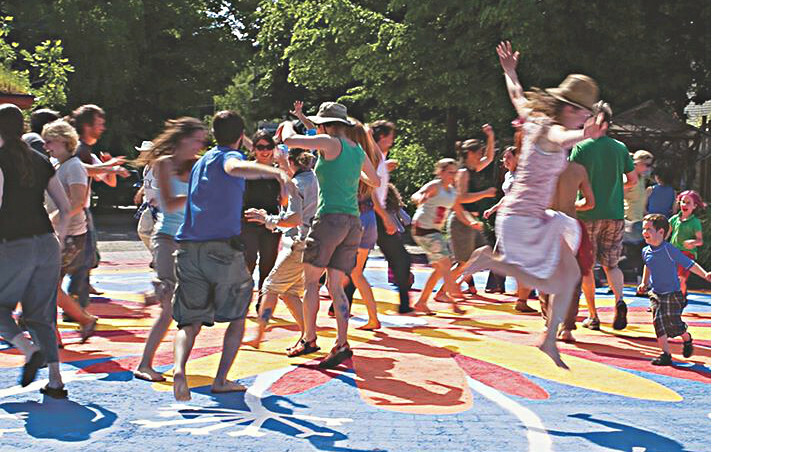 City Repair facilitates artistic and ecologically-oriented placemaking through projects that honor the interconnection of human communities and the natural world. The many projects of City Repair have been accomplished by a mostly volunteer staff and thousands of volunteer citizen activists. We provide support, resources, and opportunities to help diverse communities reclaim the culture, power, and joy that we all deserve. The projects we look at will explore themes of: gentrification, race and equity, permaculture, community based design, pollinator habitat, consensus building, natural building, and general community building.